Bob Baffert hopes to join Jim Fitzsimmons as the only trainer to saddle two Triple Crown winners. One day after shipping from Kentucky to New York, Grade 1 Kentucky Derby and Grade 1 Preakness winner Justify had an energetic 1 3/8-mile gallop around Belmont Park on June 7 in advance of the final leg of the Triple Crown. Trainer Bob Baffert said Justify would have a similar routine on June 8 and would not school in the Belmont Park paddock or the starting gate before the Grade 1 Belmont Stakes on June 9. Baffert’s other Belmont Stakes contender, Restoring Hope, also had his first gallop on the Belmont Park oval on June 7. Multiple graded stakes victor Blended Citizen put in a 1 ½-mile gallop over Belmont Park’s main track on June 6 and June 7. Blended Citizen’s score in the Grade 3 Peter Pan Stakes on May 12 makes him the only Belmont Stakes entrant to have a victory at the track. A Belmont Stakes victory would make Blended Citizen only the eighth horse to sweep the Peter Pan and Belmont double. After shipping from Kentucky, Bravazo, the only horse in the Belmont Stakes other than Justify to have competed in the first two jewels of the Triple Crown, resumed light preparation for the “Test of the Champion” with a routine gallop on June 6. According to recent records, D. Wayne Lukas, 82, would become the oldest trainer to win the Belmont Stakes should Bravazo take the honors, topping Sunny Jim Fitzsimmons’ 81 years of age when he sent out Nashua to win the 1955 edition. Should either Noble Indy or Vino Rosso win the Belmont Stakes, Todd Pletcher would become the first conditioner since Lukas won three straight from 1994-96 to take back-to-back editions of the final leg of the Triple Crown, having won last year with Tapwrit. Free Drop Billy, the lone Grade 1 winner in the Belmont Stakes besides Justify, took his first tour of Belmont Park on June 7 with one lap around the 1 ½-mile course. Trainer Dale Romans said Free Drop Billy will go through the Belmont Park paddock on his way to the track June 8 to get more familiar with his new surroundings. Gronkowski galloped 1 ½ miles over Belmont Park’s main track on June 7 for conditioner Chad Brown. After two solid workouts with the horse in New York, trainer Chad Brown confirmed that European import Gronkowski will start in the Grade 1 Belmont Stakes on June 9 at Belmont Park. Conditioner Aidan O’Brien’s Seahenge, seventh last out in the Grade 3 Pat Day Mile Stakes on the Grade 1 Kentucky Derby undercard, is scheduled to arrive at Belmont Park on June 5 for his start in the last leg of the Triple Crown. Jockey Florent Geroux will ride longshot Restoring Hope in the Belmont Stakes. Geroux will also ride Bolt d’Oro for the first time on the Belmont Stakes undercard in the Grade 1 Metropolitan Handicap. Calumet Farms’ Bandua, who had been under consideration for the Belmont Stakes, will instead start next in the Group 1 Dubai Duty Free Irish Derby at The Curragh on June 30. Multiple Grade 1 winner Justify had a half-mile breeze on May 29 at Churchill Downs and walked the shedrow in trainer Bob Baffert’s barn there the following day. Baffert, who flew from California to Louisville to supervise Justify’s workout, returned to the Golden State afterwards and planned to head back to Kentucky on June 2 or June 3 for the colt’s final exercise in advance of the Grade 1 Belmont Stakes on June 9 at Belmont Park. Justify will race with the red-and-yellow silks of the China Horse Club in the Belmont Stakes after jockey Mike Smith wore the colors of major shareholder WinStar Farm in the Grade 1 Kentucky Derby and Grade 1 Preakness Stakes. Justify is expected to ship to New York on June 6 for his attempt to sweep the Triple Crown. Justify’s stablemate Restoring Hope, who also worked at Churchill Downs on May 29 and walked in the barn Wednesday, will accompany the unbeaten Triple Crown hopeful to Belmont Park to run in the final jewel of the series. Preakness runner-up Bravazo jogged two miles at Churchill Downs on May 30 and is expected to have his lone timed workout before the Belmont Stakes at the Louisville track on May 31. Bravazo will van to New York on June 4. Preakness show finisher Tenfold galloped 1 1/8 miles at Churchill Downs on May 30 and is slated for his final Belmont Stakes work on June 2. Tenfold will be flown to New York on June 5 with stablemates from Steve Asmussen’s barn. A day after the connections of Kentucky Derby 16th-place finisher Free Drop Billy confirmed his participation in the Belmont Stakes, the colt jogged two miles at Churchill Downs on May 30. Conditioner Dale Romans said Free Drop Billy will fly to New York on June 6 along with Derby pacesetter, Promises Fulfilled, who will run on the Belmont Stakes undercard in either the Grade 2 Woody Stephens Stakes or the Easy Goer Stakes. Trainer Todd Pletcher’s Belmont Stakes-bound duo of Vino Rosso and Noble Indy will have their final works for the race at Belmont Park on June 1, weather permitting. The post position draw for the Belmont Stakes will be at 5:30 p.m. ET on June 5 in the Foxwoods Club at Citi Field before the Mets-Orioles game. Romans’ King Zachary, the winner of a Churchill Downs allowance race after the Kentucky Derby, will bypass the Easy Goer Stakes in favor of the Grade 3 Matt Winn Stakes under the Twin Spires on June 16. Kentucky Derby third-place finisher Audible will undergo complete physical testing in Kentucky and then receive time off at WinStar Farm before being pointed to stakes at Saratoga or Monmouth Park. 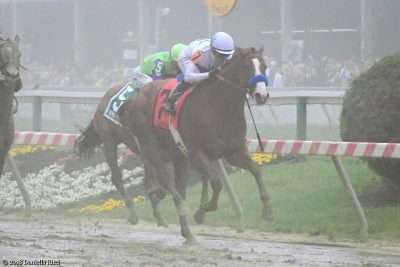 Justify held on to win the Preakness Stakes and will now seek to become the first undefeated Triple Crown winner since Seattle Slew in 1977 (photo by Danielle Ricci). Conditioner Bob Baffert returned to Louisville to watch dual classic winner Justify go through a routine gallop at Churchill Downs on the morning of May 28. Bravazo and Tenfold, second and third behind Justify in the Grade 1 Preakness Stakes, also went for routine gallops at Churchill Downs on May 28 during the reserved training window for Grade 1 Belmont Stakes contenders. Trainer Dale Romans said on May 28 that a decision on whether or not to run Kentucky Derby 16th-place finisher Free Drop Billy in the Belmont Stakes would come within a couple of days. Robby Albarado will ride Free Drop Billy if the colt runs in the final leg of the Triple Crown. Belmont Stakes hopeful Restoring Hope is slated to breeze at Churchill Downs on May 29 for Baffert. Conditioner Tom Amoss announced that Lone Sailor will skip the Belmont Stakes and make his next start in the Grade 3 Ohio Derby on June 23 at Thistledown. John Velazquez will ride Strike Power in the Grade 2 Woody Stephens Stakes on the June 9 Belmont Stakes undercard. A representative of owner Calumet Farm confirmed that Bandua, a Kentucky-bred, Irish-trained son of The Factor is an “outside possibility” to run in the Grade 1 Belmont Stakes on June 9 at Belmont Park. 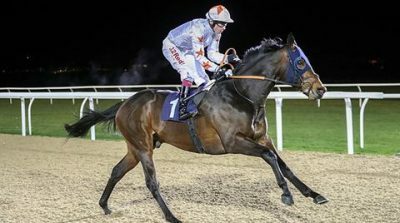 Bandua, who is two-for-two in his career running on turf at Ireland’s Cork Racecourse, is also a candidate to run June 30 in the Group 1 Dubai Duty Free Irish Derby, a 12-furlong event at the Curragh Racecourse. My Boy Jack, the fifth-place finisher in the Grade 1 Kentucky Derby, will skip the Belmont Stakes and target the Grade 1 Belmont Derby Invitational on July 7 at Belmont Park. Co-owner Justin Zayat announced that Solomini, who ran 10th in the Kentucky Derby, will not participate in the Belmont Stakes. Trainer Kiaran McLaughlin said that Enticed, 14th last out in the Kentucky Derby, will not run in the Belmont Stakes and will continue to point towards Saratoga’s Grade 1 Travers Stakes in August. Conditioner Dale Romans said that Kentucky Derby pacesetter Promises Fulfilled could run in the Grade 2 Woody Stephens Stakes on the Belmont Stakes undercard. King Zachary, who captured a Churchill Downs allowance race after the Kentucky Derby for Romans, is a candidate for the Easy Goer Stakes on the Belmont Stakes undercard. Courtlandt Farm’s Strike Power is on target for the seven-furlong Woody Stephens according to trainer Mark Hennig. Dual classic winner Justify has settled back at Churchill Downs and is scheduled to return to the track for training on May 24. Trainer Bob Baffert said that Justify will have at least one workout at Churchill Downs prior to his attempt to become the sport’s 13th Triple Crown winner in the June 9 Grade 1 Belmont Stakes. Justify’s stablemate, Restoring Hope, who finished 12th of 14 in the Grade 3 Pat Day Mile on the Grade 1 Kentucky Derby undercard, could try to spoil his Triple Crown bid for owners Gary and Mary West. Albaugh Family Stables LLC’s Free Drop Billy, 16th last out in the Kentucky Derby, is under consideration for the Belmont Stakes but could also switch to turf for his return. Graded stakes hero Untamed Domain, who completed the exacta in the Grade 2 American Turf Stakes on Kentucky Derby day, will be pointed to the grassy Grade 1 Belmont Derby Invitational on July 7 at Belmont Park. Dual Classic winner Justify exited his Grade 1 Preakness score in good shape and shipped back to Churchill Downs the morning after the race. 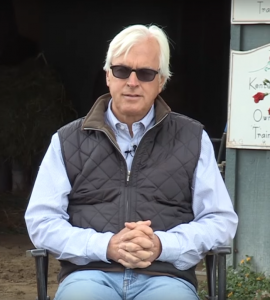 Trainer Bob Baffert plans to train Justify at Churchill Downs for two and a half weeks before shipping to New York for the Grade 1 Belmont Stakes and a shot at becoming the 13th Triple Crown winner. Conditioner D. Wayne Lukas’ Preakness duo of runner-up Bravazo and sixth-place finisher Sporting Chance left Pimlico by van well before dawn on May 20 for the return trip to Churchill Downs. Lukas said Bravazo is likely to challenge Justify again in the final leg of the Triple Crown while Sporting Chance will be given a break and be pointed to Saratoga. 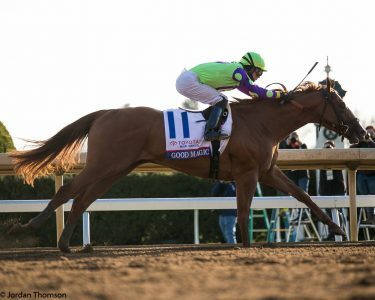 Trainer Steve Asmussen reported that Tenfold came out of his third-place effort in the Preakness well and the colt’s connections will make a decision on the Belmont Stakes about a week before the June 9 race. Good Magic, who completed the Preakness superfecta, returned to New York on May 20 and will be freshened up for a summer campaign that will likely include the Grade 1 Travers Stakes at Saratoga in August. Conditioner Tom Amoss said that Preakness fifth-place runner Lone Sailor came out of the Preakness in good order and will train at his Churchill Downs base while plans for his next race are determined. Trainer John Servis says Diamond King came out of his seventh-place finish in the Preakness well and is likely to race next in the Grade 3 Ohio Derby at Thistledown or Grade 3 Indiana Derby at Indiana Grand. Quip, who finished last after bobbling at the start of the Preakness, was in fine condition the morning after the race and was scheduled to return to Keeneland to prepare for races like the Ohio, Indiana, and West Virginia derbies. Elliott Walden, the president and chief executive of WinStar Farm, which owns both Justify and Kentucky Derby show finisher Audible along with China Horse Club, Head of Plains Partners, and Starlight Racing, said the group will takes its time before deciding whether to have Audible attempt to spoil the Triple Crown bid. Ontario-bred Flameaway, who finished 13th in the Kentucky Derby, will not run in the $1 million Queen’s Plate at Woodbine on June 30 and instead be pointed to the Ohio Derby. Good Magic (photo by Jordan Thomson). Grade 1 Kentucky Derby champ Justify arrived at Pimlico for the Grade 1 Preakness Stakes on the afternoon of May 16 and was installed as the race’s 1-2 morning line favorite after drawing post position seven. Derby runner-up Good Magic galloped over Pimlico’s muddy track at approximately 7:30 a.m. on May 16 and is slated for a paddock schooling session on May 17. Hall of Fame trainer D. Wayne Lukas’ two Preakness candidates, Bravazo and Sporting Chance, schooled in the Pimlico paddock during the morning of May 16 before exercising on the course. Conditioner Tom Amoss said Derby eighth-place finisher Lone Sailor will train at Pimlico on the morning of May 17 shortly after the track opens at 5:30 a.m., as was his routine at Churchill Downs. Grade 2 Tampa Bay Derby winner Quip arrived at Pimlico May 16 after traveling on the same flight from Louisville as Justify and Lone Sailor. Winchell Thoroughbreds’ Tenfold, who walked the shedrow on the morning of May 16 after arriving at Pimlico late Tuesday afternoon via a van ride from Churchill Downs, is expected to gallop on the track soon after it opens on Thursday morning and then stand in the starting gate during Friday’s training session. Cash is King, LC Racing and D.J. Stable’s Preakness contender Diamond King jogged one mile over a muddy main track at Parx on May 16 before shipping to Pimlico. Trainer Aiden O’Brien said Kentucky Derby last-place finisher Mendelssohn will race again on dirt in America, possibly at Saratoga, about two months before his year-end target, the Grade 1 Breeders’ Cup Classic at Churchill Downs on November 3. Grade 1 Kentucky Derby champ Justify stood in the Churchill Downs starting gate on the morning of May 13 before galloping a little more than a mile and a half over the track. Justify is expected to continue galloping to prepare for the May 19 Grade 1 Preakness Stakes at Pimlico. Trainer Chad Brown confirmed Derby runner-up Good Magic for the Preakness and said his charge will van from New York to Baltimore on May 14. Good Magic will gallop at Pimlico on May 15 and daily for the remainder of the week. Bravazo, sixth in the Derby for conditioner D. Wayne Lukas, breezed a half-mile at Churchill Downs on May 13 and will van to Pimlico on May 14 for the second leg of the Triple Crown. Lukas’ other Preakness hopeful, Sporting Chance, was reported to have refused to breeze May 13 by the Churchill Downs clockers even when given at least three chances to do so. Trainer Tom Amoss confirmed Derby eighth-place runner Lone Sailor for the Preakness. Conditioner Mick Ruis again reversed course with Bolt d’Oro and said the 12th-place finisher in the Derby will skip the middle jewel of the Triple Crown and instead target Grade 1 Met Mile on the Grade 1 Belmont Stakes card June 9. Grade 1 Arkansas Derby runner-up Quip posted his final Preakness work at Keeneland on May 13 and will remain at the Lexington track until he ships to Baltimore on May 16. Conditioner John Servis confirmed that Javier Castellano will ride Federico Tesio Stakes hero Diamond King in the Preakness. Ricardo Santana, Jr., aboard for Tenfold’s two victories, regained the mount for the Preakness after Victor Espinoza rode the colt to a fifth-place finish in the Arkansas Derby. Trainer Dallas Stewart reported that Givemeaminit will bypass the Preakness and target the June 9 Grade 2 Woody Stephens Stakes at Belmont Park. Blended Citizen, who was excluded from the Derby as an also-eligible entrant before winning Belmont Park’s Grade 3 Peter Pan Stakes on May 12, is probable to run in the final leg of the Triple Crown. Noble Indy, who finished 17th in the Derby, will be pointed to the Easy Goer Stakes on the Belmont Stakes undercard. Grade 1 Kentucky Derby champion and Grade 1 Preakness Stakes favorite Justify resumed training at Churchill Downs on May 10 with a strong gallop that dispelled any concerns about a minor foot bruise that was detected the morning after he ran for the roses. Justify will be flown Baltimore on May 16 for his start in the second leg of the Triple Crown. Justify’s jockey, Mike Smith, has been suspended by California stewards from May 17 – 20 for careless riding in Santa Anita’s eighth race on May 6, but the sanction is not expected to interfere with his ability to ride Justify in the Preakness. Under California’s designated race rule, which allows jockeys to ride graded stakes while under suspension for penalties of 10 days or less, Smith can request a stay to allow him to ride until he can appeal the penalty or ride in the Preakness. Trainer Chad Brown reported that Derby runner-up Good Magic remains a candidate for the middle jewel of the Triple Crown, and he expects to make his decision whether to run the son of 2007 Preakness winner Curlin by May 14. Conditioner D. Wayne Lukas reported that Luis Saez will ride Derby sixth-place finisher Bravazo in the Preakness and Luis Contreras will be aboard Grade 1 winner Sporting Chance. Trainer Tom Amoss said he expects to make a Preakness participation decision on Derby eighth-place runner Lone Sailor on May 12, after a discussion with owner Gayle Benson. Owner/trainer Mick Ruis confirmed that Bolt d’Oro, 12th in the Run for the Roses, is a candidate for the Preakness, along with the grassy Grade 2 Penn Mile on June 2 at Penn National and the Grade 2 Woody Stephens at seven furlongs on dirt on the June 9 Belmont Stakes undercard. Ruis has announced that jockey Corey Nakatani will be reunited with Bolt d’Oro for the colt’s next start. Conditioner John Servis Thursday confirmed Cash is King, D.J. Stable and LC Racing’s Federico Tesio Stakes winner Diamond King, who is entered in the May 12 Grade 3 Peter Pan Stakes at Belmont Park, will make his next start in the Preakness. Servis plans to give Diamond King, a bay son of Quality Road, one final breeze for the Preakness this weekend at Parx. Florent Geroux will have the Preakness mount on Grade 1 Arkansas Derby runner-up Quip. Trainer Todd Pletcher said Pony Up, runner-up to Blended Citizen in the Grade 3 Jeff Ruby Steaks at Turfway Park in March, is possible for the Preakness, with the Sir Barton Stakes on the undercard as a backup. Valene Farms’ Louisiana-bred Givemeaminit, third in the Grade 3 Pat Day Mile on the Derby undercard, is also a possibility for the Preakness, though the Woody Stephens is more likely. Trainer Tom Amoss confirmed that Grade 1 Kentucky Derby eighth-place finisher Lone Sailor is possible for the Grade 1 Preakness Stakes on May 19 at Pimlico. Conditioner Steve Asmussen said that Grade 1 Arkansas Derby fifth-place runner Tenfold is probable for the Preakness. Grade 3 Lexington Stakes runner-up Telekinesis is under consideration for the Preakness according to trainer Mark Casse. Donegal Racing is considering the Preakness for Hyndford after the colt romped in a May 4 starter allowance contest at Belmont Park, though the June 9 Easy Goer Stakes in New York is more likely. Gronkowski, who topped the leaderboard for the inaugural European Road to the Kentucky Derby then had to decline his automatic invitation due to injury, has been removed from Jeremy Noseda’s barn and will be transferred to Chad Brown. The Grade 1 Belmont Stakes on June 9 at Belmont Park is still a possible plan for Gronkowski. Grade 1 Kentucky Derby champion Justify exited his victory in good order will remain at Churchill Downs until the middle of next week when he travels to Baltimore for the May 19 Grade 1 Preakness Stakes at Pimlico. Justify will likely have three days of walking the shedrow and return to the track on the morning of May 9 under the supervision of assistant trainer Jimmy Barnes. Justify’s conditioner, Bob Baffert, has never lost the middle jewel of the Triple Crown with a Kentucky Derby winner. Derby runner-up Good Magic will return to Chad Brown’s barn at Belmont Park and his connections are expected to decide quickly whether or not to run in the Preakness. Brown said the Grade 1 Belmont Stakes on June 9 is unlikely for Good Magic regardless of his participation in the Preakness. Derby show finisher Audible will ship to New York on May 7, along with trainer Todd Pletcher’s three other colts who ran for the roses, and his next race is to be determined. Instilled Regard, who completed the Derby superfecta, is headed for a 30-day freshening at Taylor Made Farm in Central Kentucky and most likely be pointed to major races this summer. My Boy Jack, the Derby’s fifth-place finisher, came out of the race with some cuts on his front legs and will be flown back to Southern California on May 8 for a brief break in training. Calumet Farm’s Bravazo exited his sixth-place finish in the Derby well and is a candidate for the second leg of the Triple Crown. Hofburg, seventh in the Derby with a troubled trip, is likely to return in the Belmont Stakes. Lone Sailor exited his eighth-place Derby effort well and will remain in trainer Tom Amoss’ Barn 29 at Churchill Downs while his connections decide on his next start. Derby ninth-place runner Vino Rosso, who required multiple attempts by Pletcher’s team to flush the dirt and mud out of his eyes after the race, will be pointed to the Belmont Stakes. Solomini, who finished 10th in the Derby under Flavien Prat, is a candidate for the final leg of the Triple Crown. Firenze Fire, 11th in the Run for the Roses, shipped back to Belmont Park on May 6 and will be pointed to shorter races. Derby 12th-place finisher Bolt d’Oro is slated to ship back to owner/trainer Mick Ruis’ Santa Anita stable Tuesday with the Grade 1 Pacific Classic at Del Mar in August as his main goal. Flameaway, the 13th-place runner in the Derby, is expected to ultimately join trainer Mark Casse’s Woodbine string and prepare for the Queen’s Plate there on June 30. Assistant trainer Neal McLaughlin said Derby 14th-place finisher Enticed came out of the race with “a couple of little nicks” and is unlikely to run in the Preakness. Enticed shipped to Saratoga on May 7 and the colt’s main goal will be the Grade 1 Travers there in August, with the Belmont Stakes possible for his next start. Conditioner Dale Romans’ Derby duo of pacesetter Promises Fulfilled (15th) and Free Drop Bill (16th) will remain in Churchill Downs barn 4 while plans for their returns are made. Noble Indy came out of his 17th-place Derby try in good shape and his next start is to be determined. Next race plans are pending for Derby 18th-place runner Combatant, who has raced five times already this year. Magnum Moon, 19th in the Derby, will take a break from racing and be pointed for other races down the road. Last-place Derby finisher Mendelssohn was flown back to his Ballydoyle base in Ireland on May 7. Trainer Aidan O’Brien confirmed that the Grade 1 Breeders’ Cup Classic this fall at Churchill Downs is the long-term goal for his charge. Non-Derby runners pointing to the second jewel of the Triple Crown include Diamond King, Sporting Chance and Quip. Diamond King received a free berth in the Preakness by winning the Federico Tesio Stakes at Laurel Park on April 21. Sporting Chance will travel by van to Pimlico with fellow D. Wayne Lukas trainee Bravazo on the Tuesday or Wednesday of Preakness week. Probables for Belmont Park’s Grade 3 Peter Pan Stakes on May 12 Ax Man, Blended Citizen, Core Beliefs, Gotta Go, High North, and Zing Zang. Just Whistle and Pony Up are listed as possible for the Peter Pan by NYRA’s press office. Likely Kentucky Derby favorite Justify is scheduled to ship on April 30 from Santa Anita to Churchill Downs, where he will try to become the first horse since 1882 to win the roses having not raced as a juvenile. Instilled Regard, fourth last out behind Justify in the Grade 1 Santa Anita Derby, will also travel to Kentucky on April 30. Drayden Van Dyke was named to ride Instilled Regard in the Kentucky Derby. Jockey Florent Geroux will be aboard Grade 2 Louisiana Derby winner Noble Indy in the Run for the Roses. Jockey Luis Contreras will ride Grade 2 Risen Star Stakes champ Bravazo for the first time in the Kentucky Derby. Bolt d’Oro jockey Victor Espinoza will wear the Spendthrift Farm silks in the Kentucky Derby as a Christmas gift from owner and trainer Mick Ruis to B. Wayne Hughes, who purchased half of the breeding rights in the colt last year. Grade 1 Florida Derby runner-up Hofburg galloped over the Churchill Downs track on April 25, one day after arriving there from Payson Park, and is slated to have his final pre-Derby workout on April 29. Kentucky Derby contenders scheduled to have final pre-Kentucky Derby workouts on April 28 at Churchill Downs include Good Magic, Flameaway, Promises Fulfilled, Free Drop Billy and My Boy Jack. Ricardo Santana, Jr. was named to ride Combatant after Steve Asmussen’s charge drew into the Derby field. Asmussen said Snapper Sinclair, who had been under consideration for the Derby and other stakes races next week at Churchill Downs, will be given a brief freshening. Asmussen’s Reride, who earned 20 Kentucky Derby qualifying points with his show finish in the Grade 2 UAE Derby at Meydan, will not participate in the Run for the Roses even if he can get in, but is possible for the Grade 1 Preakness Stakes on May 19 at Pimlico. Grade 1 Arkansas Derby runner-up Quip, who was withdrawn from Kentucky Derby consideration on April 23, is being pointed to the Grade 1 Preakness Stakes at Pimlico two weeks later. Phoenix Thoroughbreds’ Gronkowski, who was unable to accept his automatic invitation to run for the roses as the leader of the European Road to the Kentucky Derby, is recovering well from an infection and targeting the Grade 1 Belmont Stakes on June 9 at Belmont Park. Gronkowski, ultimately, is being pointed to the Grade 1 Breeders’ Cup Classic at Churchill Downs in the fall. Trainer Dale Romans finalized jockeys for his two Grade 1 Kentucky Derby contenders by naming Robby Albarado to ride Free Drop Billy and Corey Lanerie to pilot Promises Fulfilled. Juvenile champ Good Magic traveled from Keeneland on April 22 and settled in barn 42 at Churchill Downs. Grade 3 Lexington Stakes hero My Boy Jack also arrived from Keeneland on April 22 and took up residence in Churchill Downs’ barn 25 for conditioner Keith Desormeaux. West Point Thoroughbreds purchased an interest in My Boy Jack and joined Don’t Tell My Wife Stables and Monomoy Stables, LLC as owners of the colt. Trainer Todd Pletcher’s quartet of Kentucky Derby starters — Audible, Magnum Moon, Noble Indy and Vino Rosso — are scheduled to arrive at Churchill Downs from their winter base at Palm Beach Downs on the afternoon of April 23. Grade 1 Florida Derby runner-up Hofburg will van from Payson Park to Churchill Downs on April 23 and complete his final preparations to run for the roses over the Louisville track. Probable Derby favorite Justify will work once more at Santa Anita and is scheduled to arrive at Churchill Downs the week of the Derby along with stablemate Solomini. Owner and conditioner Mick Ruis said the two-time Grade 1 winner Bolt d’Oro will have his final pre-Derby workout at Santa Anita on April 28 before the colt ships to Churchill Downs. 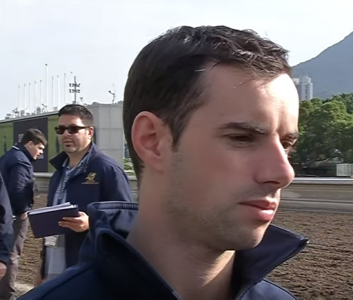 Trainer Aidan O’Brien said he expects regular jockey Ryan Moore to ride Mendelssohn, who is slated to travel from Ireland to Kentucky on April 30, in the Derby. Diamond King, who captured Laurel Park’s $125,000 Federico Tesio Stakes on April 21, will likely point to the Grade 1 Preakness Stakes at Pimlico on May 19. Jockey Paco Lopez was named to ride multiple graded stakes champ Firenze Fire in the May 5 Run for the Roses, his first mount in the Grade 1 Kentucky Derby. Weather permitting, trainer Kiaran McLaughlin plans to work multiple graded stakes winner Enticed at the Palm Meadows Training Center on April 19 and 26 before shipping to Churchill Downs for the Derby. The NFL’s New England Patriots star Rob Gronkowski acquired a minority stake in Gronkowski, the 3-year-old colt named after him who earned an invitation to run for the roses by winning the European Road to the Kentucky Derby. Conditioner Jerry Hollendorfer said Instilled Regard, fourth in the Grade 1 Santa Anita Derby on April 7, is a candidate for the Kentucky Derby if he can gain a berth in the field. The colt currently sits 22nd in the standings with 29 Kentucky Derby qualifying points. He can gain a spot in the gate if two runners ranked above him are removed from consideration. Jeff Bloom, who owns Snapper Sinclair through his Bloom Racing Stable, said that his colt, now 23rd on the points leaderboard, is more likely to run at Churchill Downs in the Grade 2 American Turf Stakes or Grade 3 Pat Day Mile on May 5 even if a Kentucky Derby berth becomes available. Turfway Park’s Grade 3 Jeff Ruby Stakes hero Blended Citizen, now 24th on the leaderboard, is also targeting the Derby if enough defections occur to allow the colt to get into the field. Trainer Doug O’Neill said the American Turf is the back-up race for Blended Citizen, with Kyle Frey scheduled to ride in whichever race the colt enters. High North, winner of Oaklawn Park’s Northern Spur Stakes on the Grade 1 Arkansas Derby undercard, is under consideration for the Pat Day Mile, Belmont Park’s Grade 3 Peter Pan Stakes on May 12 and Pimlico’s Grade 1 Preakness Stakes on May 19. Florent Geroux will ride Arkansas Derby runner-up Quip in the Kentucky Derby. Grade 3 Sunland Derby winner Runaway Ghost will miss the Grade 1 Kentucky Derby after coming out of April 14 work with a hairline fracture to his right front cannon bone. Grade 1 Arkansas Derby champion Magnum Moon returned to his South Florida winter base at Palm Beach Downs on April 15 and will ship to Churchill Downs on April 23. Luis Saez, who has ridden Magnum Moon in each of his starts, will retain the mount in the Kentucky Derby. Florent Geroux, who has been aboard Arkansas Derby runner-up Quip in all of his races, was confirmed as the colt’s jockey in the Run for the Roses. Arkansas Derby show finisher Solomini is scheduled to fly back to California on April 16 and will train over the next two weeks at Santa Anita before traveling to Churchill Downs on April 28 or April 30 for the Kentucky Derby. Arkansas Derby fourth-place finisher Combatant, who currently ranks 21st on the Kentucky Derby leaderboard with 32 points, will ship to Churchill Downs this week with the rest of conditioner Steve Asmussen’s Oaklawn Park division. Grade 3 Lexington Stakes hero My Boy Jack is likely to ship to Churchill Downs April 21. Unbeaten Grade 1 Santa Anita Derby victor Justify is slated to have two works prior to the Kentucky Derby. Santa Anita Derby runner-up Bolt d’Oro will have his first Kentucky Derby work on April 22 and his second on April 28 before shipping to Churchill Downs on April 30. Irad Ortiz, Jr., the nation’s current leading rider in wins this year, will ride Grade 1 Florida Derby runner-up Hofburg in the Kentucky Derby. Trainer Bill Mott said he is inclined to ship Hofburg to Churchill Downs prior to his next breeze. Hofburg will be Mott’s first Kentucky Derby starter since Holding Back finished 12th in 2009. Kentucky Derby and Kentucky Oaks horses will have an exclusive training window at Churchill Downs beginning Saturday, April 21 through Thursday, May 3 from 7:30 – 7:45 a.m.
Grade 2 Rebel Stakes winner Magnum Moon was installed as the 8/5 morning line favorite in Oaklawn Park’s April 14 Grade 1 Arkansas Derby, the last qualifying points race for the 144th edition of the Grade 1 Kentucky Derby on May 5. Machismo, who was a badly-beaten 12th of 14 runners in Keeneland’s Grade 2 Toyota Blue Grass Stakes on April 7, was entered in the Arkansas Derby in a final attempt to earn a chance to run for the roses. Trainer Keith Desormeaux told a national teleconference audience on April 10 that Grade 2 Louisiana Derby show finisher My Boy Jack will need to win Keeneland’s April 14 Grade 3 Lexington Stakes decisively to continue on to the Kentucky Derby. Gronkwoski, who is named after New England Patriots tight end Rob Gronkowski and earned a berth in the Kentucky Derby by winning the new European series of qualifying races, will ship to the U.S. a week before the first Saturday in May and should clear quarantine in time to train over the Churchill Downs track the Tuesday of race week. Five Kentucky Derby contenders are now stabled on the Churchill Downs backstretch: Bravazo (trainer D. Wayne Lukas, barn 44); Flameaway (Mark Casse, barn 36); Free Drop Billy (Dale Romans, barn 4); Lone Sailor (Tom Amoss, barn 29); and Promises Fulfilled (Romans, barn 4). Amoss confirmed that James Graham, who rode Lone Sailor to a second-place finish in the Louisiana Derby at Fair Grounds, will have the repeat call in the Kentucky Derby.